Who is Setting the Pace? I’ve asked myself this question many times since starting the Camino, actually, before I even began. To plan the trip, I consulted a guidebook and Internet forums about how long it takes to complete. 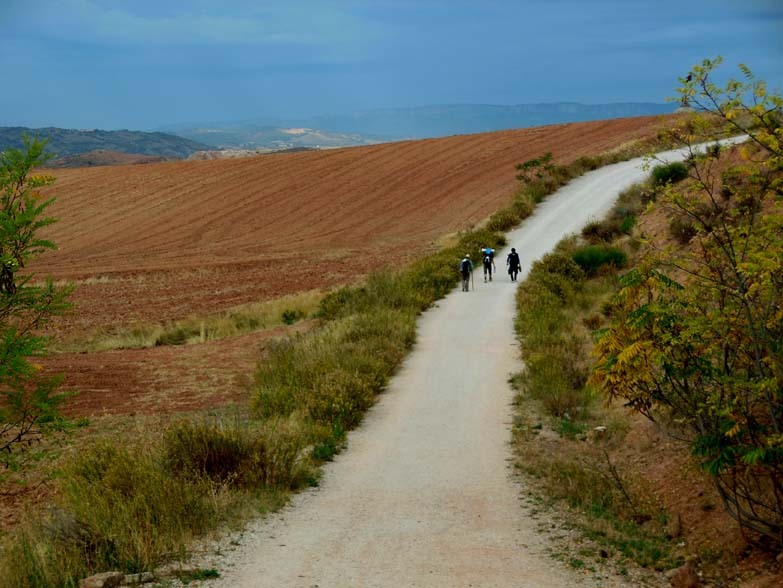 Depending on whom you ask, the trek from St. Jean Pied de Port to Santiago de Compostela can take anywhere from 33 to 35 days, if not more, depending on fitness, speed and weather conditions. Since I had never done anything like this before, and I also wanted to walk even further (to Finisterre, on the coast), I padded my schedule by several extra days, just in case. The commonly accepted first “stage” of this journey is the hardest, with 4,000′ of elevation gain and a total distance of nearly 16 miles. It is a whopper of a hike, even for a hiker such as myself. I debated at length whether to do it in one day, like so many others, or break it up into two pieces. My ego wanted to do it “by the book” to prove to itself how fit and strong I am and to follow what most other pilgrims were doing. My wiser self, aware that I was jet lagged and probably carrying too much weight, suggested I stop after just a few kilometers and stay at an auberge, still on the French side, and continue the next morning. That was what I decided. Still, I felt I was either wimping out or not giving myself the spiritual benefits of a huge physical challenge. When I arrived at the auberge eager to cover more ground, and with a whole afternoon to do my laundry and then gaze at the Pyrenees, I wondered if I had made the wrong decision. As many other people walked uphill, I felt I was being left behind. Later, I met several Pilgrims who had pushed themselves too hard, too fast that first day, either because they were following the guidebook or had met an interesting and speedy person and were determined to keep up, and hurt themselves in the process. They admired my choice to stop and slow down. Today, I learned of a guy who walked 50km (30 miles) the first day, above and beyond the norm, simply because he wasn’t listening to himself, and injured his legs and feet so badly that he hasn’t been able to walk for several days. Other folks I’ve met have allowed their eagerness or goal setting to trump their physical capacity; now, instead of walking steadily, they have stopped to nurse huge blisters. It is an easy trap to fall into, not just on the trail. In real life, we´re often encouraged, overtly or subtly, to move according to someone else´s tempo or schedule. There is peer pressure, work deadlines, or other external demands that take us out of ourselves. That is how I ended up with shin splints: walking too fast on hard surfaces to either stay in a conversation or make it to a particular destination. Since those first days, I’ve tried to be more aware of why I am walking at a certain speed. Is it my pace, or am I trying to squeeze a few extra kilometers into the day, or am I trying to catch up to someone (or slow down for them)? While I’ve met several interesting people with whom I’ve walked a few hours at a stretch, when our natural paces diverge I’ve learned to release the companionship, either moving ahead or falling behind. Often, I´ll meet up with them later at a hostel or along the path, but some of them I might not see again for a few days, if ever. Early on, I spent too much time wondering about the folks I might not encounter again. But such obsessing took me away from the people in front of me, and from the moment I was inhabiting. And then yesterday, walking around the town of Najera in the evening after a rainstorm, I peered into the restaurant where I had eaten paella earlier in the day. There sat the Quebec couple I met on my first day but had “lost” for about a week. I walked in to say hello. “If you go slow, you can go a long way,” he said. It is something I keep forgetting; luckily, the snails underfoot on the Camino serve as reminders. So glad you are able to post so I can follow along with you!